10-CD-album Box Set + 1-DVD, box in LP-size with 464-page book (30x30), 316 tracks (Audio), 27 tracks (DVD), playing time CDs approx. 12 hours. The greatest-ever tribute to the man they called 'Duke' on the thirtieth anniversary of his death! John Wayne is gone but not forgotten - he is still among the Top Three most popular movie actors of all time. 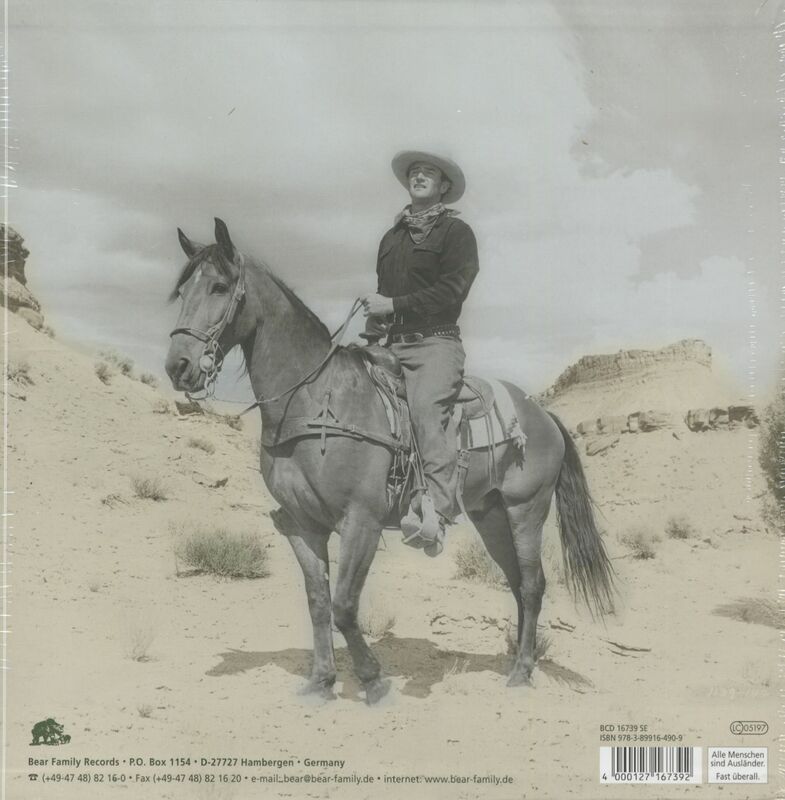 The soundtrack music to his never-to-be-forgotten westerns! All the title songs by the original artists! Songs inspired by the movies! 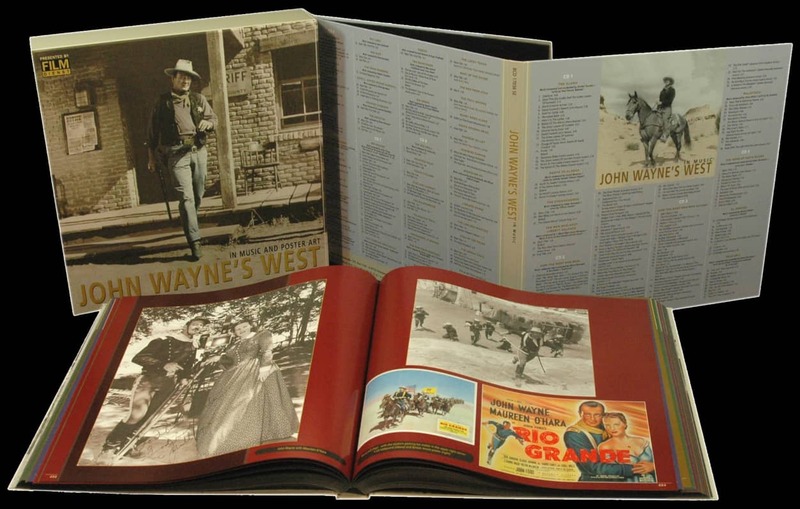 A 464-page LP-sized book with a biography by historian Richard W. Bann, AND Reproductions of hundreds of his western movie posters from many different countries! A bonus DVD with trailers and exclusive 'behind-the-scenes' footage! A man and an actor as big as John Wayne deserves a tribute like this! John Wayne was America. And America ...in fact, the entire world... has not forgotten John Wayne. Thirty years after his death, the man known as 'Duke' still ranks among the Top Three most popular American film stars of all time. More than any other actor, he chose roles that glorified traditional American values and would not compromise his personal image. 'Don't apologize,' he said in 'She Wore A Yellow Ribbon,' 'it's a sign of weakness.' 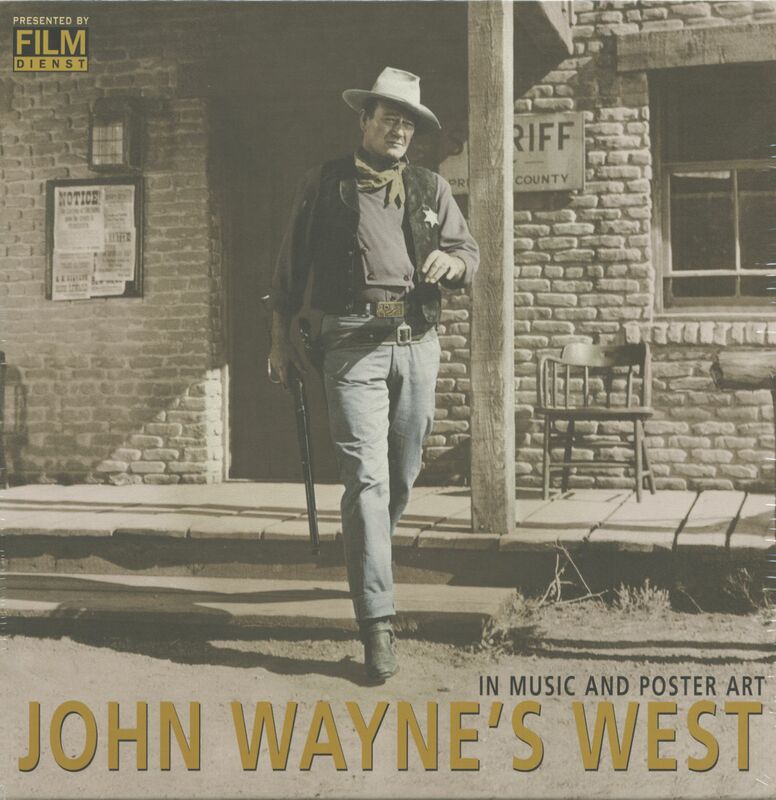 That was John Wayne, and that's the John Wayne celebrated here in the music and poster art from his many memorable western movies. 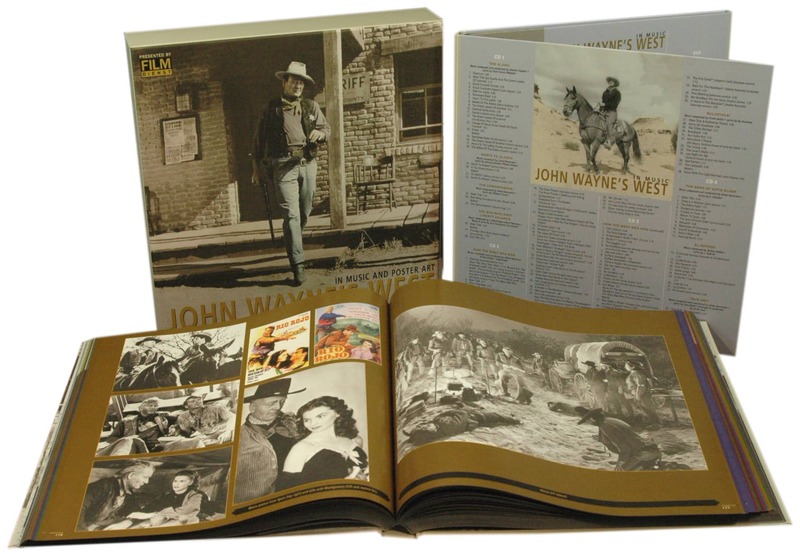 This 10 CD-album Box Set + 1 DVD collection contains the rousing soundtracks of his best-loved westerns, including 'The Searchers', 'The Alamo', 'The Sons Of Katie Elder' and 'True Grit'. The artists performing the original soundtrack songs include the Sons Of The Pioneers, Glen Campbell, The Limeliters, Ed Ames, Johnny Cash, Marty Robbins, and many more. Plus! 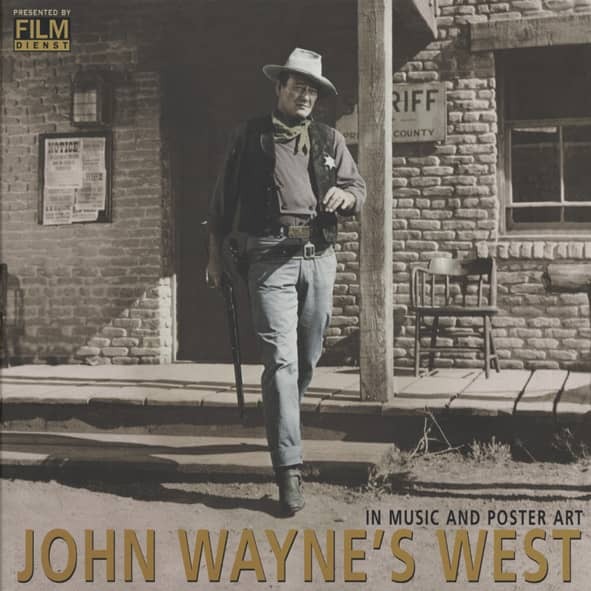 bonus songs inspired by John Wayne's movies, such as Frankie Avalon's The Ballad Of The Alamo, Gene Pitney's The Man Who Shot Liberty Valance, and Claude King's The Comancheros. The bonus DVD contains trailers and exclusive behind-the-scenes footage! - The Alamo - North To Alaska - The Comancheros - The Man Who Shot Liberty Valance - How The West Was Won - McLintock! - The Sons Of Katie Elder - El Dorado - True Grit - The Horse Soldiers - War Wagon - The Undefeated - Chisum - Rio Lobo - Big Jake - The Train Robbers - Cahill, United States Marshal - Rooster Cogburn - The Shootist - Rio Grande - The Fighting Kentuckian - Hondo - The Searchers - Rio Bravo - The Big Trail - Haunted Gold - Texas Cyclone - Ride Him, Cowboy - The Big Stampede - Telegraph Trail - Somewhere In Sonora - Man From Monterey - Riders Of Destiny - Sagebrush Trail - The Dawn Rider - The Lucky Texan - The Star Packer - Texas Terror - Paradise Canyon - West Of The Divide - Blue Steel - The Man From Utah - The Trail Beyond - Randy Rides Alone - The Lawless Frontier - The Lawless Range - 'Neath Arizona Skies - Rainbow Valley - The Desert Trail - Westward Ho - - The Lawless Nineties - King Of The Pecos - The Lonely Trail - Winds Of The Wasteland - Pals Of The Saddle - The Night Riders - Overland Stage Raiders - Red River Range - Three Texas Steers - Stagecoach - Wyoming Outlaw - The New Frontier - Allegheny Uprising - Dark Command - The Shepherd Of The Hills - The Spoilers - In Old California - Lady Takes A Chance - In Old Oklahoma (War Of The Wildcats) - Tall In The Saddle - Flame Of The Barbary Coast - Dakota - Angel And The Badman - Fort Apache - Red River - She Wore A Yellow Ribbon - Three Godfathers -- DVD Trailers: Stagecoach - She Wore A Yellow Ribbon - Three Godfathers - Rio Grande - Hondo - The Searchers - Rio Bravo - The Horse Soldiers - The Alamo - North To Alaska - The Comancheros - The Man Who Shot Liberty Valance - How The West Was Won - McLintock! - The Sons Of Katie Elder The War Wagon - El Dorado - True Grit - The Undefeated - Chisum - Rio Lobo - Big Jake - The Cowboys - The Train Robbers - Cahill, United States Marshal - Rooster Cogburn - The Shootist. 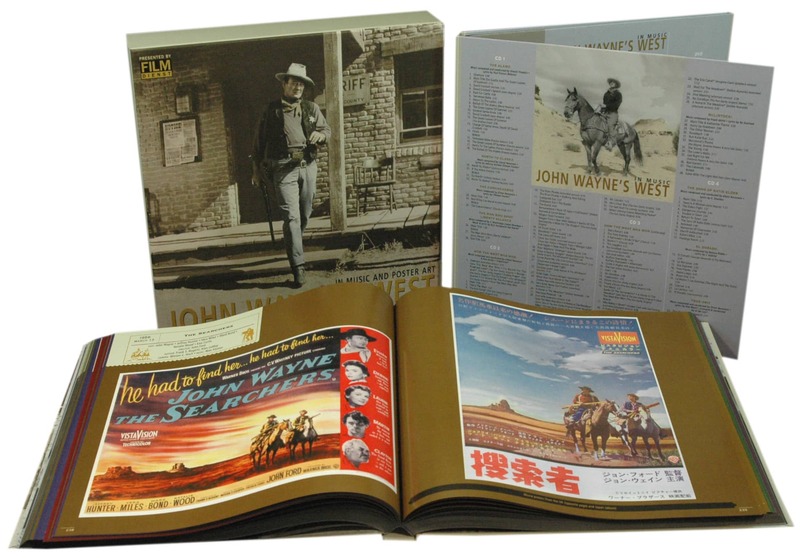 Customer evaluation for "John Wayne's West - In Music And Poster Art (10-CD & 1-DVD)"
Awesome remastering! 60's and 70's titles sound like 2016 (older titles do not sound as good but surely better than they never did)! 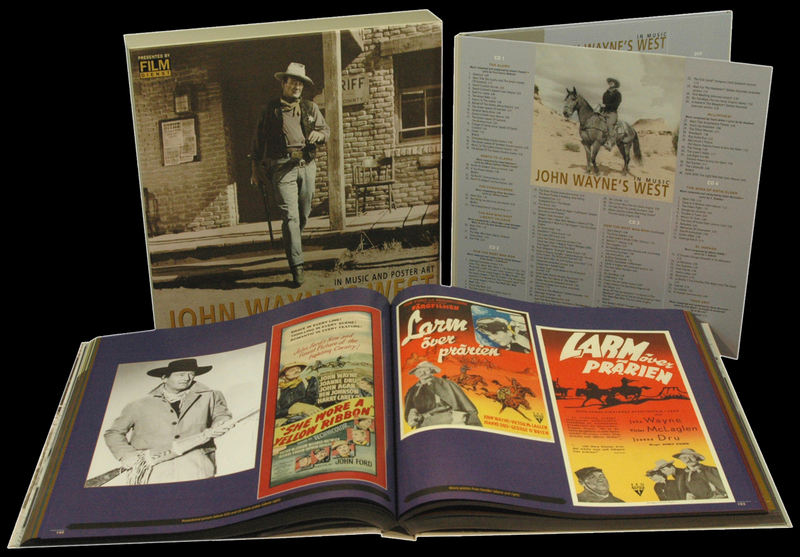 Music and songs from more than 65 classic westerns! The rarest tracks as bonuses (alternate studio, movie versions, covers)! My first Bear Family box set, surely not the last! I just received my \JOHN WAYNE'S WEST\" and I am absolutely thrilled. Credos to all who worked on this, they need a raise! I've been trying to find recordings of songs from my favorite John Wayne/John Ford films for I don't know how long, and this is it. And I can't tell you how I stumbled onto it. But what a collection!! Absolutely fantastic!! !